Disclaimer: This software is experimental, it might harm your user profile. Not FF 3.5 compatible. Click the "Download Now" button, confirm install. Click on the "GO" button, which appears in the top left on the additional tool bar in your Firefox browser to initialize CCFF. Click on the OK button in the popup window to finalize the installation process. 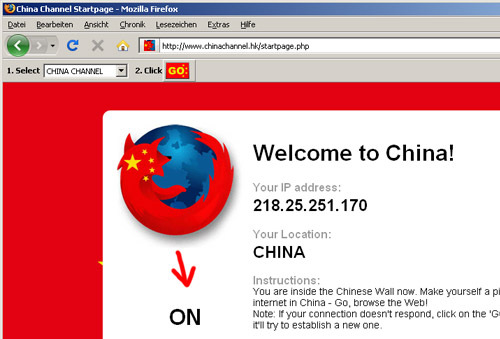 Select "CHINA CHANNEL" and click "GO", you will get connected through a random proxy server in China now. 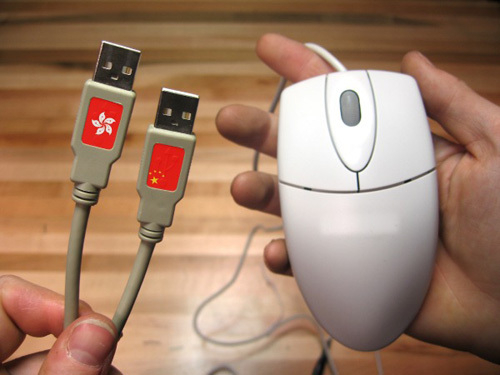 Note: For the most part the Chinese web will feel a lot like home. You will, however, begin to notices differences if you start asking Google about sensitive issues (for example Tananmen Square protests, or Pro Tibetan issues). The internet is often seen as the borderless, global, everybody connecting, democratic network. But in fact the internet is not the same for everybody, not talking about the people without access. State borders and filtering depending on the country you are living in has become standard in the recent years. In example: Due to copyright issues certain music or TV cast services are only available for the country they are broadcasted in. Have you ever tried to watch BBC HD content not surfing from Great Britain or listening to Pandora music outside of US? But this trivial compared to certain countries in the world who pratice heavy political internet censorship. 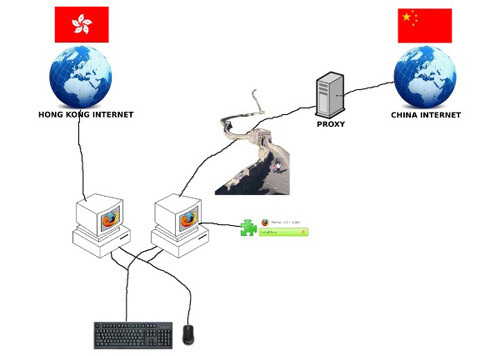 States like Saudi Arabia, Iran, Syria, Vietnam, Tunesia and in big scale China do strict political internet censorship by blocking IP adresses and by dynamic content filters. User in these countries are not able to access regime critical information. Especially China blocking off 1,3 billion inhabitants censors the internet with the support of western technology companies as Cisco, Yahoo or Google. 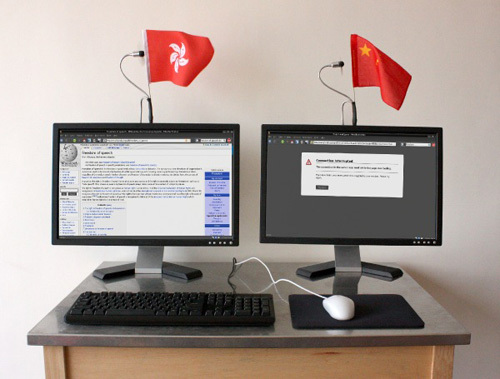 (### citation needed) The Golden Shield Project (sometimes referred to as the the Great Fire Wall of China), censors content primarily by blocking IP addresses. The Internet police in China is estimated to contain over 30,000 workers, and is responsible for blocking content such as Tibetan independence, Taiwan independence, police brutality, the Tienanmen Square protests of 1989, freedom of speech, democracy, religion, and some international news.Just try yourself and see what it is like to surf the web from China. 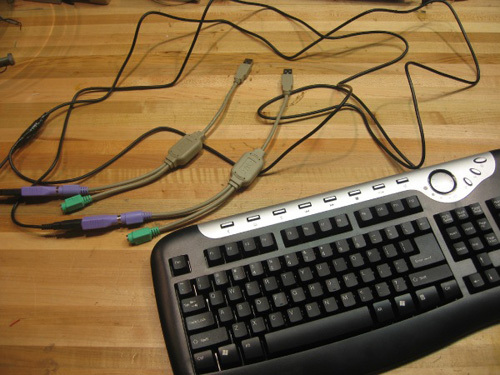 The add-on is based on Jeremy Gillick's Switch Proxy add-on, for which we are very thanksful (and if you are looking for a more functional proxy tool his project is what you're looking for).